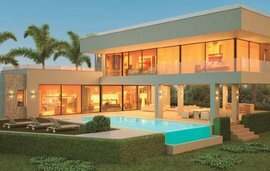 Only 2 left so don''t miss outThese off plan villas are located in Atalaya which is conveniently located between Estepona and the well known yachting Marina of Puerto Banus. 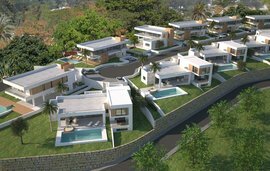 These off plan villas are located in Atalaya which is conveniently located between Estepona and the well known yachting Marina of Puerto Banus. Located within walking distance to all amenities and it is set in the heart of 10 high standard golf courses. It is close to restaurants, superb beaches, schools and shops. There are a total of 18 high contemporary villas to choose from comprising of 3 and 4 bedrooms. They have been created in an appealing cul-de-sac that creatively contrasts state-of-the-art contemporary property designs with the surrounding vegetation and light to produce elegant properties. The developer has taken pride in the practicality of these homes making sure that the most basic requirements have been taken into account from the start. They have done this by ensuring that there are plenty of storage spaces, internal and external access to the basement, a utility room next to the kitchen, en-suite bathrooms for every bedroom, non-slip flooring finishes in the bathrooms and around the swimming pool and they have even thought of a hidden chute to easily move washing from bedrooms to basement making life much easier. Each property has its own swimming pool and the villas are separated by white flowered honey suckle hedges. The rear gardens have been arranged to provide lots of colour, fruits and fragrance. There are 4 different designs to choose from and these can be from 1 storey to 3 storeys.